Thursday April 14 was opening day of the 2011 baseball season for the Double A Reading Phillies (R-Phils), and I had an opportunity to visit what has been hailed as America’s Classic Ballpark, Reading’s FirstEnergy Stadium. Opened in 1950 this fixture in the heart of the city of Reading has undergone 10 million dollars in renovations during the off season. Having never experienced baseball in Reading I didn’t have a point of comparison but the wide open plaza that greeted fans upon entering the gates was one much needed change that the crowd seemed happy to see. FirstEnergy stadium is truly a classic style minor league ballpark. One immediately gets the feeling of being transported to an earlier time. There are no luxury suites to be found and although there are signs of sponsorship throughout, the feeling is less corporate than in other similar facilities. Interaction with the players is common at FirstEnergy where often the players can be found wandering the plaza and concourse area prior to game time. While players may occasionally get stopped by fans to pose for a picture or sign an autograph, they are generally able to go about their business unbothered. FirstEnergy Stadium features fixed seats as well as bleacher style seating. There is even a swimming pool along right field. All seats have excellent lines of sight and the ballpark has a cozy, intimate atmosphere. Seat sections are determined by color coding with blue seats being closest to the field followed by yellow and red. There is also a party deck for group outings. Food options are plentiful and feature ballpark mainstays as well as other offerings such as the green menu featuring healthy fare. Lines were never an issue due to the abundance of concession points of sale. 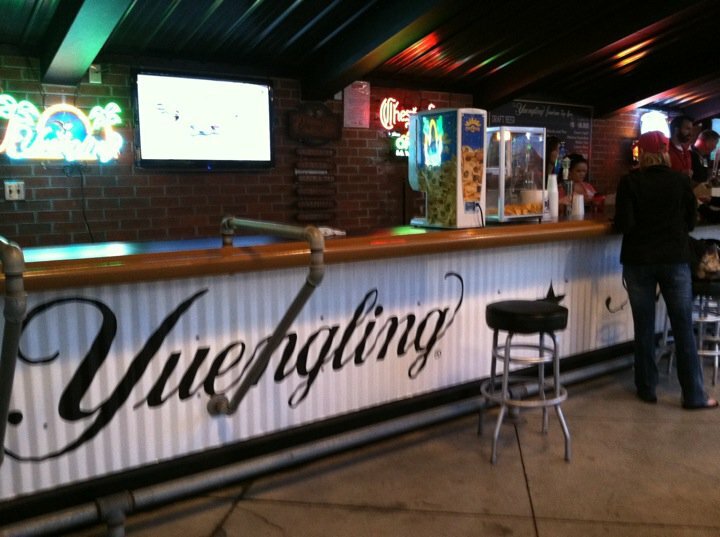 Underneath the bleachers along the main plaza is the Yuengling bar where fans can take cover and relax with a cold brew. Vendors were frequent visitors to fans who preferred to remain in their seats. Philly Pretzels, cold beer, cracker jacks and cotton candy were a few of the items available from the vendors roaming the stands. Once fans are seated there is plenty of entertainment to keep the interest of both the young and old. If mascots are your thing, you will want to make it a point to visit FirstEnergy Stadium where they are plentiful. Screwball who resembles a drooling version of Mr. Met with his large baseball head and dangling tongue is the team mascot and entertains fans throughout the game. There is also a full mascot band (who I hear actually play their own instruments), veggie racers, and even sponsor mascots such as Drip, a blue water drop from Essig Water Systems. Most popular among Reading fans is the Crazy Hot Dog Vendor who is often seen on his Ostrich or pedaling a hot dog cart throughout the stadium and entertaining fans on field between innings. Longtime fans are also celebrated and one beloved mainstay at R-Phils games is a fellow by the name of Adam Briscoe. Briscoe is the R-Phils’ wildly popular #1 fan and is well known amongst the FirstEnergy faithful for his Briscoe Disco which consists of manic fist pumping on the field and in the stands. Make eye contact or call out his name and he will steamroll his way over to you and engage you in a Disco Briscoe battle. Be prepared to lose, Briscoe does not tire easily. 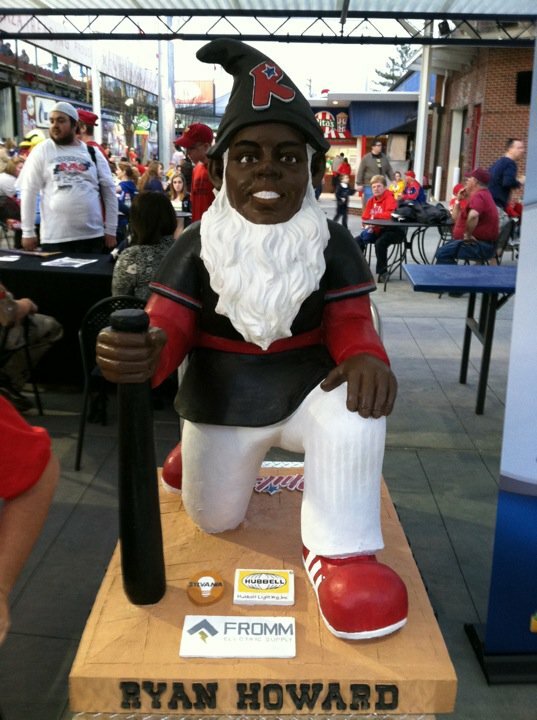 Other highlights of opening day were the Ryan Howard garden gnomes given to the first 3,000 fans entering the ballpark, culminating with the raffle of a life size 500lb version during the game. The caveat for potential winners of the 500lb garden gnome was that it had to be transported home that evening (I placed everyone I even remotely knew with a pickup truck on speed dial). Fortunately for my pickup driving friends and acquaintances, I was not the raffle winner. Another highlight was watching Kane Kalas son of the late Phillies broadcaster Harry Kalas perform the national anthem. Kane Kalas is gifted with a deep baritone voice and he did honor to the anthem. If I were to grade FirstEnergy Stadium, I would give it a solid A+ for its old timey charm, friendly staff and entertainment value. Parking is a bit difficult as the majority is on the street in the surrounding area. Luckily the ballpark is in an industrial section of Reading and neighbors are not impacted. Best advice is to arrive early if you can to secure a spot in the small stadium parking lot. Parking is free which softens the pain of having a long walk to the entrance. The new entrance plaza gets another A+ for providing a county fair midway feel and plenty of eating options while allowing fans to socialize without feeling crowded. The ballpark was extremely clean and several of the R-Phils clean team members were spotted keeping ahead of potential trash build up. Fans are well behaved and seem proud of their hometown facility. If you have a chance to head out to Reading for a ballgame it is well worth the drive, you will surely appreciate the relaxed environment at America’s classic ballpark. Thanks Dan! FirstEnergy Stadium is truly a gem and I look forward to returning again this season. My only regret is I waited this long to pay a visit. What’s black and white and ref all over? · Derby, sports and random happenings.